Hedonism II - Whats Included? Oops – we screwed up. Our newsletter dated April 4th had incorrect information regarding the newly announced Bliss Celebrity Infinity Revolution - April 19 - 24, 2021. Totally our fault (yep, we’re human and sometimes make mistakes). Following is the correct information, and it looks even more exciting. IGNORE OUR NEWSLETTER FROM APRIL 4th. Otherwise you’ll be on the wrong ship on the wrong dates going to the wrong place. And it won’t be as much fun as the new Bliss Cruise sailing April 19 - 24, 2021. Following is the correct information. Thanks for your understanding. Leading clothing-optional lifestyle charter announces its tenth consecutive cruise on board the Celebrity Infinity Revolution for a 2021 sailing. 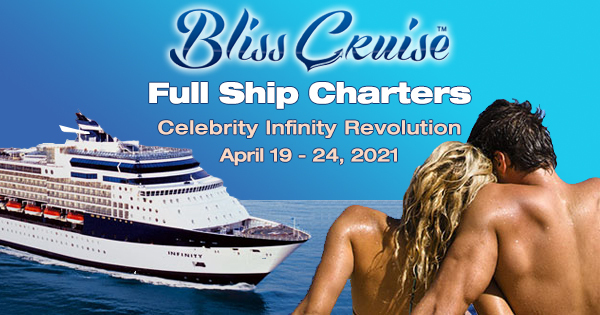 Coral Springs, FL - Bliss Mgt, LLC [Bliss Cruise] today announced the signing of the Celebrity Infinity, its April 19 - 24, 2021 adult charter cruise, to its impressive charter portfolio. The five-day sailing will depart from Miami and visit Ocho Rios, Jamaica and Georgetown, Grand Cayman. The signing continues with a $25,000,000.00 ( 25 Million ) investment made by Bliss Cruise toward future sailings. Celebrity Cruises will spend over $500 million in the coming years to revitalize its fleet of luxury ships. Dubbed the "Celebrity Revolution," the effort will include a revitalization of staterooms and public spaces aboard nine Celebrity ships to bring their level of luxury up to the standards of the line's forthcoming class of ships, the "Celebrity Edge." The entire project is set to be completed between February 2019 and February 2023. See your favorite travel agent for cabin selection, as bookings go live on March 27, 2019. "Our Revolutionized passengers will be one of the first to enjoy the stunningly redesigned accommodations on the Celebrity Infinity," said Brian Depenbrock, President of Bliss Cruise. "These are exciting times for passengers." Renovated ships will also feature new Retreat Sundecks, complete with loungers and cabanas, plus food and beverage service. The Suite Class-only restaurant, Luminae, will be reimagined, with an all-new look and custom menus created by Celebrity's Michelin-starred chef partner, Cornelius Gallagher. Staterooms will also have Celebrity's eXhale bedding including those luxurious cashmere mattresses, and new high-tech features such as RFID locks, Xcelerate and Bluetooth capabilities. Wayne Kraushar, Vice President of Logistical Operations said Bliss Cruise built its brand around ship selection giving passengers the luxury they expect in an adult lifestyle charter at an affordable price. "Ship selection is important. Bliss knows how and when to select ships," he said. Bliss Cruise is America's largest adult-only, full-ship, clothing-optional charter entertainment company with itineraries sailing from Florida to the Eastern, Western and now Southern Caribbean. The voyages attract many open-minded groups such as lifestyle couples, nudists, voyeurs and exhibitionists as well as curious individuals looking to experience something different from the conventional cruise vacation. Celebrity Cruises is a premium cruise line which was founded in 1988. In 1997, Celebrity Cruises Ltd. merged with Royal Caribbean International to become Royal Caribbean Cruises Ltd., which operates Celebrity, Royal Caribbean International, Azamara Club Cruises, Pullmantur Cruises and CDF Croisières de France. The company has its headquarters in Miami, Florida. Common features on board Celebrity brand ships feature aft-glass dining rooms, formal foyer areas, alternate dining venues, balcony and suite staterooms, pools and lounging areas, bars and lounges, libraries, spas and gyms, and relaxation areas. Subscribe to learn about exciting adventures and offers from World Exotic Travel. Your information will never be shared.